The area of southeastern New Hampshire that makes up Madbury was sometimes called Barbados due to the fact that many of the residents traded with Barbados back in the 1700s. The name transferred to some of the natural features in the area, namely Barbados Pond. Madbury Parish was first incorporated in 1755, and the town was granted privileges in 1768 by Governor John Wentworth. Though it is situated near areas of industry, Madbury has always maintained a rural character, and the main trades were lumbering and agriculture for a long portion of the town's history. Click here for more information on the Town of Madbury. The 250th anniversary of this proud New Hampshire town is commemorated by a couple of unique pieces, and we at Hampshire Pewter are honored to be part of that celebration! The town is selling their one-of-a-kind custom pewter ornaments as well as commemorative license plates with the 250th anniversary logo on them. If you would like to purchase either of these commemorative items, please click here. The pewter ornament was a collaboration between the 250th anniversary committee and our artists at Hampshire Pewter. It started with a picture of the town offices building, and became a two-sided and unique piece of art. The front side of the ornament features the street view of the town offices building, which houses all of the municipal operations for the town. The back of the ornament shows two oxen hard at work pulling a cart with wooden barrels on it. There is also a banner that declares "250th Anniversary" just underneath the oxen. This scene is an homage to the agricultural and farming roots of the this New England town. The detailing on both sides of the ornament can only be accomplished through a process of antiquing and blackening to emphasize the depth and dimensions in the original design. Once an ornament is blackened and antiqued, it goes through a process of buffing that allows the shine of the pewter to come through, and accentuate the detailing in the designs. Each ornament is buffed by hand and inspected before it gets dusted, ribboned, and packaged. Our custom pewter pieces are truly one-of-a-kind, and our goal is always to take the customer's vision and bring it to fruition. 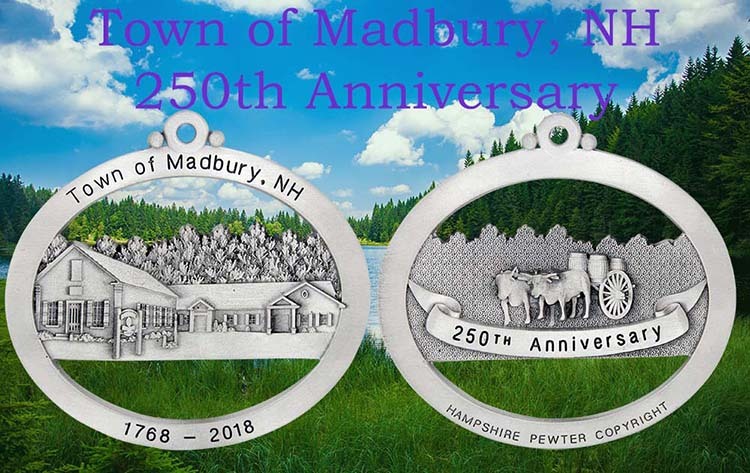 For the Town of Madbury's 250th Anniversary, we were happy to bring their vision to life of a truly unique ornament that represented their proud town and its rich history. Click here for more information on how to commission a custom ornament for your town/city anniversary, a corporate gift, or more!